Only the second edition this year, (4 in 2000, 3 in 2001) and editor Paul Fraser states in the introduction that henceforth his magazine will be an ‘occasional’ publication. Citing its loss-making, one imagines that profitability (or a smaller loss) will be no easier on that basis. I personally felt that the one-man magazine would have benefitted from the editor concentrating on the fiction, rather than also doing a substantial review section as well. After all, with the well-established UK magazine Interzone producing high quality reviews and a comprehensive books received listing every month, Fraser’s reviews and listing were always several months behind that source. This is one of his ‘Kethani’ series, in which aliens have enabled humans to resurrect after death, provided they have a small piece of technology implanted in their temple. The story is somewhat telegraphed, as we find that the main protagonist’s ex-wife is religiously opposed to the alien technology, and their daughter is therefore one of the few not implanted. A hacking cough suggests that this absence may be to the daughter’s imminent disadvantage. We then hear that there are some black marketeers trading in non-kosher implants, and it is therefore no surprise when the daughter is given weeks to live, the mother appears to finally give in and allow her to be implanted, but cheats by having a non-functioning implant installed. Will the father find out and get a proper implant in his daughter in time? A future London, in which it is a la mode to dress in Jacobean style, and to frequent theatrical presentations of that era. Jeriko is a young man entranced by the romance of the theatre, and by one of the leading ladies in particular. When a letter beseeching his help arrives, evidently from that lady, he is overcome with desire and sets out to make an assignation. As the story unfolds we find out that the leading lady is in fact an automaton, and the pair stumble into the countryside to be together the course of true love runs not smooth (certainly not as smooth as that part of the otherwise perfectly detailed body which so inflames Jeriko). An enigmatic, poetic story, which sticks in the mind far longer than most. Chris Lawson. Faster, higher, stronger. ‘Written in Blood’ was a standout short story from Lawson a year or two ago. This is somewhat more pedestrian. Its take on drug use in sport isn’t particularly incisive, and merely probes just how far athletes will go in taking drugs to boost their performance. Adam Roberts. The Imperial Army. An ultra-condensed military SF story – Roberts packs into a short story what many authors would stretch several volumes. A big hand to Roberts though, for starting his story with a young boy masturbating. The first time this plot device has been used? The onanism is integral to the story – the young boy is being paid for his efforts, and his sperm is being used to create superhuman soldiers in humanity’s battle against an insectoid enemy. The story is in effect a take on Verhoeven’s film version of RAH’s ‘Starship Troopers’, with the young man rapidly rising through the ranks of the army, avoiding the moral dilemmas of what they are doing. When the military turn on their non-combatant fellow humans, this turns out to be the final straw, and the protagonist rebels. Charles Stross. The Atrocity Archive. The third and closing installment of Stross’s story, which I reviewed in previous issues. 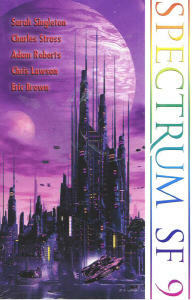 It is sad to see Spectrum SF gradually slipping away from us. Despite an over-reliance on two or three authors, the quality of the fiction was generally of a very good standard. Certainly Spectrum SF 9 appears to have a more substantial fiction content than the recently launched UK magazine ‘3SF’. But did it/does it have enough to exist in a notoriously difficult part of the publishing industry?